Call it fate or just coincidence, but for Thomas M. Thompson, it was a job at an aluminum foundry that thrust him into the rental business 62 years ago. "Dad was working for a foundry in Aurora, Illinois," says Thomas K. Thompson, Thomas M.’s son, who now serves as president of Thompson Rental Station, Bensenville and Des Plaines IL. "They had a lot of equipment breakdowns. My dad would use the one rental store in town to rent tools to fix the equipment at the foundry. During those visits to the rental store, my dad would talk to the owner about rental. After a while, my dad developed a severe reaction to the ammonia used at the foundry. Knowing that he had to leave, he got the idea of setting up his own rental business." So in 1957, Thomas M. moved his family back to his hometown of Bensenville and set up shop. "He rented a small storefront and offered a general tool rental and drain-cleaning business," Thomas K. says. "Dad handled the plumbing and Mom handled the store. She could rent a Skilsaw. If someone wanted to rent something heavy, they would need to come in later when my dad was there." Unfortunately, business didn’t take off with a bang. "The first month he only took in $30," Thomas K. says. But slowly, the business did grow to the point where his dad had to decide whether to stay in rental or plumbing. Rental prevailed. 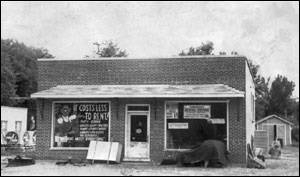 At that time, there weren’t many rental stores in the area. Realizing the need for mutual support, Thomas M. went to hear Leonard Hawk, one of the original organizers of what is now the American Rental Association, speak about association benefits. "My dad always was an association person," Thomas K. says. "He also was involved in the organization of the Chicagoland group -- the local association affiliated with the ARA. I used to go with him to meetings and now sit on the board." Being such a new industry, all of the rental owners in the area saw themselves more as colleagues than competitors. For instance, in the early years when money was tight, if rental owners couldn’t afford to buy a piece of equipment, they all put in money and split the rent, Thomas K. says. "It took us 10 years to buy our first tractor. It was so exciting. We had a big party." With the support of his fellow rental owners and his family, Thomas M. was able to grow his business. Thomas K. came on board full-time in 1964. In the early ’70s, when his brother-in-law, Chuck Schlie, joined the business, they moved the Bensenville operation to the location they are at today. Then, in 1985, Thomas K.’s wife, Barb, joined the business. In 1993, when his son, T.K., came on board, they bought their second location in Lombard IL. The expansion trend continued to include four locations in the Greater Chicago area: Bensenville, Lombard, Morton Grove, and Des Plaines. With additional locations came more diverse inventory. For instance, the Des Plaines operation serves more of the party market than the Bensenville store, which serves primarily general tool and light construction needs. In the late 1970s, Thomas K. and Schlie thought it might be wise to market strictly to the construction market, but is now grateful he didn’t take that step. "Dad was about to retire and we wanted to better control our hours," Thomas K. says. "But then there was a slump in the economy. I am glad we didn’t throw out the homeowners." That move also saved him during the consolidation period. He was contacted by a potential buyer, but after looking at his operation, they saw he didn’t have the desired inventory mix. "They didn’t have a lot of interest in us as we were primarily general tool," Thomas K. says. This was actually welcome news, because he wanted to keep his business growing and thriving. "I was in my late 40s and was determined to stay in rental," he says. "Dad got me involved in the business. This business has been good to my family. If I quit, what would I do?" That dedication to business is the reason Thompson Rental Station is such a rental force in the Chicagoland area. With his father’s passing and his brother-in-law’s retirement from rental, Thomas K., along with his wife and son are making sure that both remaining locations in Bensenville and Des Plaines IL run smoothly and continue to grow. "My dad always said that if you’re not growing your business, you’re going out of business," he says. When catering to diverse markets, Thompson says listening to his customers is the way to determine how to grow his business. "We have different types of customers at each store," he says. "We have to listen to them; they’ll tell us what direction we need to go." That sage advice has kept Thompson Rental Station flourishing for the past 62 years and it is the force that will keep the business meeting the rental needs of customers in the greater Chicago area for years to come.